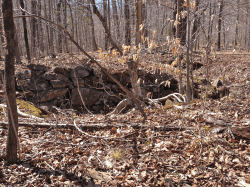 The foundation of the home of Augustus and Josephine Howard on Old Stoddard Road. The home in which Jacob and Abigail Wheeler enjoyed the use of the two north rooms. The Sawyer Family’s contract (see other article) transferring the family place from father to son in return for lifetime of support was a common arrangement many families found useful. Historians call these “maintenance agreements.” In the Sawyer case it provided a working farm for a son looking to establish his own farm and provided his parents with an assurance that they could live comfortably when they were no longer able to work the farm. The author has read and recorded ten contracts between generations in Packersfield and Nelson covering nine families. These are in the form of deeds recorded at the Cheshire County Registry of Deeds. Undoubtedly many more families made similar but less formal, arrangements. The ten formal contracts we do have, document the change in the daily life of early Nelson as farm families changed from a virtually cashless and self-sufficient lifestyle to one more integrated with others and, indeed, the whole world. World events beyond the world of New England hill farms determined the changes these agreements reflect. The day-to-day requirements of life reflected in these agreements changed as life on Nelson’s farms changed. In 1810 the Sawyer Family was very much a part of an economy where each farm produced virtually everything the family needed. The exceptions were blacksmithing, sawing, joinery, tanning and leather working, milling and doctoring. Cash was rarely the medium of exchange. The diary of Abner Sanger, a farm laborer who lived in Keene and Dublin during this period, documents the wide variety of tasks it took to run the family farm of that period and an elaborate system of accounts that was used to document the barter between families. Tabitha Sawyer and her daughters made all of the clothes for her family. The women spun both flax and wool into yarn, wove that yarn into linen and woolen cloth and a mixture with the warmth of wool and the durability of linen called linsey-woolsey. The agreement provided 30 pounds of flax and 12 pounds of wool for this purpose. Tabitha used tallow to make soap for the family; 12 pounds were provided. In an earlier time tallow was used to make candles, but by 1810 farmhouses were largely lit by whale oil lamps. Benjamin and Tabitha were provided a horse for transportation, shoes and boots and doctoring. Their funerals and burials were part of the arrangement, too. 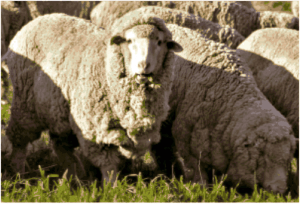 One substantial change brought by the war and the embargo was the introduction of Merino sheep from Spain. The British embargo on wool and wool clothing exports to the U.S. prior to the war led to a ‘Merino Craze’, with William Jarvis of the Diplomatic Corps importing at least 3,500 sheep between 1809 and 1811 through Portugal. This craze came to Nelson just as the war was ending. The first inclusion of sheep in a maintenance agreement in Nelson [the war years saw the town’s name changed] was that agreed to between Jonathan Lovejoy and his son Jonathan JR in 1819. There were other new items in the Baker contract that reflected the resumption of trade: The Bakers got tea, sugar, pepper, all spice, cinnamon, molasses and rum. Rum became a staple of agreements going forward. These products came from the West Indies and China. Death and burial benefits were dropped; the town had begun to provide burial services for its citizens funded by taxpayers. The Baker agreement was made when Thomas Baker was 64 and his son-in-law, 30. 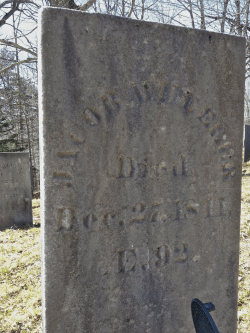 The agreement lasted until Sarah Baker died in 1847 at the age of 85. By the time Jacob and Abigail Wheeler made an agreement with her son Augustus Howard in 1828, their list of provisions reflected an even greater connection with the world outside Nelson. They were to receive the usual grain and locally raised meat. To these were added twenty-eight pounds of dried fish. They still received flax and the wool of four sheep and they received eighteen yards of cotton cloth. Their tea was hysong tea (green tea from China). They drank coffee, but not much – only two pounds. Additional items on their list included five barrels of cider, sixty pounds of “four meal cheese” and $6 per year in spending money. They had the use of a horse and carriage. Note the changes in only eight years: dried fish was now a common part of the Nelson diet. The agreement of William and Mary Parker included it in 1831 as did the Wheelers in the renewal of their agreement in 1833. Cider was now being produced by several mills in Nelson and was considered a staple part of the diet. It was almost certainly alcoholic. Cotton cloth reflected not just a shift from wool and linen, but another effect of the Embargo and war: an industrial transformation of America stimulated by the cut off of similar goods from Europe. The Nelson Cotton and Woolen Company was founded at the outlet of Granite Lake by Asa Beard and some fifteen other Nelson men in 1814. The carriage reflected the growing prosperity of Nelson farmers occasioned by the sheep boom sweeping New Hampshire and six dollars in spending money reflected a local economy where cash could be readily used. Perhaps the carriage reflected a better road system as well.